I’m afraid my post titles sound all too redundant. This is the second post this summer where the title is “Saving [Insert hisoric site pertinent to Black History here]. Last time, I wrote about 5 Pointz. This time, I’m writing about the Chatham-Kent Black Mecca Museum. I had the pleasure of visiting Chatham, Canada in June. Chatham gets many visitors who want to learn about Black history. It’s approximately an hour away from Detroit; three hours from Toronto. It is there I learned about Canada’s African history. Here in the US, we are taught that African slaves traversed the Underground Railroad to their way to freedom to the “the North” and Canada. We were also taught that once the slaves settled North they were subjected to racism and discrimination. But the dots aren’t connected for us as to what happened to slaves that went further north to Canada. It’s as if they ran off into the Canadian sunset, never to be heard of again. But of course that’s not true. When I visited the Chatham Kent Black Mecca Museum, I learned that 40,000 freedom seekers made it to Canada on the Underground Railroad. 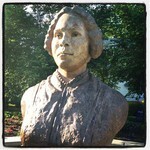 I learned about Mary Ann Shadd Cary, the first black woman in North America to publish a newspaper (and the first woman in Canada to do so!) And I learned that Chatham was even referred to as the “Colored Man’s Paris” with Blacks thriving in business, education, and cultural arts among other fields. A monument to Cary in the BME Freedom Park in Chatham. The history of the Chatham-Kent Black Community is so rich that it encompasses several generations, beginning with the struggle for freedom and the triumphant rise made by people of African descent. It is an exceedingly important piece of the of the story of African Canadian people; however, what must be remembered is that the history is not simply African Canadian History, but a significant facet of Canadian history that should not be forgotten. Blair Newby demonstrates a deterrent for slaves running away. If a slave was caught, this would be put on their neck. There are bells and fish hooks so that the master can hear the slave and also the slave would be caught in bushes by the fish hooks if they tried to run away again. Unfortunately, the funding of the museum is threatened due to budget cuts. This is a huge blow to the progress the institution has made, even being promoted to museum status in December 2012. But there may be a way to avoid these cuts, and all you need to do is write a letter. Send a letter to the Chatham-Kent Municipal and encourage them to continue to fund the museum. In my letter, I’m going to include the facts that I learned while I visited. Also, request that letter to be included in the Councilors’ package for the July 15, 2013 Meeting. Letters can be sent to council@chatham-kent.ca. Let’s do our part to preserve Canada’s African history.